How did people make physical copies of photographs when the camera was first made? in 1the 1800s, how did they "print" the picture so they could have the physical copy? did the camera print it like in polaroids? If all you have is a print. you take a photograph of it. If you have a negative, you make another print from it. It those days, and indeed in all photography on film or on glass "plates", the usual rendering from the camera was a "negative", in which all the tones of the scene were reversed - the sky looks dark, and shadow areas look light. The negative can then be printed to make a normal print (photograph) as many times as you want, on many different occasions if needed. You could print the negatives at home, using a "darkroom", but most people took the negs to a photo retailer, or to Walmart etc, so that the laboratory could make the prints. Quite possibly your older relatives have negatives in their possession which you could look at. Colour negatives have all the colours reversed also, and a strong overall orange tone for technical reasons. I the early days of photography a light sensitive emulsion was painted onto various substrates such as glass and tin. Once a black card or painted surface was behind the glass plate, the image was visible. There was no negative. Other types of photographic medium used a paper negative. To get a positive image, the paper was placed on top of another piece of paper which was also coated with an emulsion. It wasn't until the gelatin silver negative which produced a negative was it possible to produce multiple copies of an exposure. Do a search for Tin Type and Daguerreotype for more information. A great reference book is "A World History of Photography" by Naomi Rosenblum which is a common text used in college-level photo history classes. No. It was developed in different chemical baths much the same way film is still developed today. I had a photography class in highschool and we developed the old fashioned way. We took the film in a dark room, placed it in front of a light source to shine on photo sensitive paper, for a specific time. You would then put the paper in a chemical bath to develop the image, then into another bath to neutralize the chemicals and stop the development. Then hang the paper up to dry. The first cameras were big! and the photographic material used, metal then later glass, was the same size as the final image. The very tirst cameras uses the Daguerreotype process, that produced an image directly on a metal plate after development. There were various other early types of photographic system. Later ones used glass photographic plates to create a negative image. When the plate was developed, fixed and dried it could be used to make a "print" (or many prints) by exposing photographic paper through the glass plate, making a negative of a negative so ending up with a true image. The photographic paper needs developing, fixing and drying and is then a finished photograph. A similar type of mix of light-sensitive chemicals and gelatin was later used to coat a strip of plastic - nitrocellulose in early film - to create roll film, where a number of photos could be taken by winding a new area of film into position behind the lens. When developed, that could be used to produce small contact prints, or put in to an enlarger, which is basically a projector used to project a larger version of the film image on to photographic paper. By adjusting the enlarger height, the image size can be made as large as needed and again, any number of copies of the film image can be made. 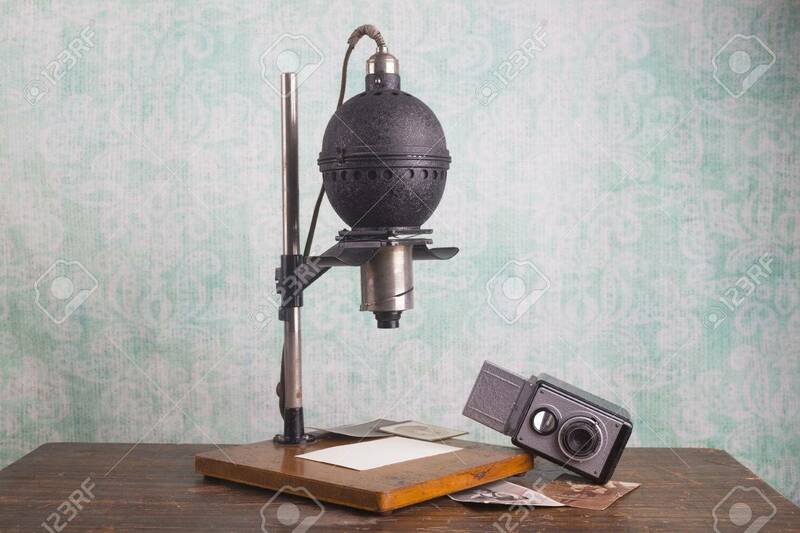 This is a typical early enlarger, with a camera in the photo as well. The same system carried on to more modern 35mm film, again that's developed and fixed, then an enlarger use to transfer the images to prints on photographic paper, which is then developed and fixed in turn. If you want more copies later on, you send the original film to have more enlargements made. The video below shows the stages of using an enlarger then developing the print. The stages of development are the developer itself, which makes the image visible, a rinse or "stop bath" to wash off or neutralise the developer and stop the image getting darker, the the fixer which dissolves out all the unexposed silver compounds so the images does not change later on when exposed to daylight. Monochrome "black and white" film and photographic paper are normally not sensitive to red light, so it's possible to work in a darkroom with a red "safe light" and see what you are doing. Colour film came along a lot later on in the history of photography and though the outline sequence is the same, developing uses rather more chemical stages and must be done in total darkness as it's sensitive to all visible light.